Love the Netherlands, Go Newcastle! First of all, I’m not a blogger and this is my first attempt at writing a piece about cycling. I’m not a cycling expert either, I’m just a simple girl who rides a bike in Newcastle and turned into an active campaigner because, above all, I believe that collectively we can change a lot for the better. I’m not doing it because I’m some kind of anti-car eco-warrior; I’m campaigning so that other people can enjoy the incredible range of benefits that everyday cycling offers. It is not about converting people; I have tried, had some success but also failed on many fronts to get friends, family and work colleagues to get into the saddle and leave the car at home. It is, above all, about changing our urban environment and the way we are building cities. Stop building roads for cars which disconnect neighbourhoods and communities and start creating a people-friendly infrastructure where cycling facilities are provided for everybody to use and enjoy. There are two things that really annoy and frustrate me; the first one is the general public view on cycling and the “weirdo” label that comes with someone who rides a bike in cities instead of driving a car. As a woman, in particular, cycling in the UK as a means of transport is an oddity at its best and a nonsense at its worst. The second thing is the strong belief that we cannot have what cities like Copenhagen and Amsterdam have, i.e. 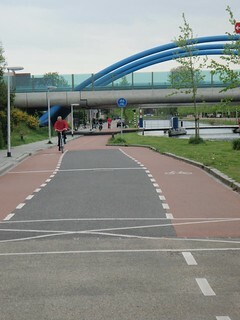 a quality cycling infrastructure. Politicians have always warm words to say about cycling, but nobody has the guts to have a go at creating cyclist-friendly cities. The Netherlands, where I spent a week for the very first time at the beginning of May 2012 have succeeded in creating a cycling nation. 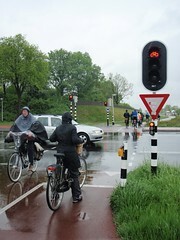 Dutch people are not born cyclists, they live in an environment where cycling is easy, safe and convenient. And because cycling is easy, safe and convenient, everybody cycles – newborns are being carried on bikes, toddlers ride with parents, teenagers cycle to school and groups of pensioners ride socially. It even made me wonder how wonderful it must be for the Dutch NHS to care for such a super active population. So my motivation to go to the Netherlands was pretty straightforward: I had to see it for myself, preferably on a bike and guided by experts. Surprisingly the Dutch don’t really market and sell their world-class expertise when it comes to the cycling infrastructure. But luckily for us, we have the Hembrows. I don’t need to introduce the famous David Hembrow who, besides always having a view from the cycle path, has built up over the years a unique and impressive library of maps, photos, and detailed accounts of the wonderful Dutch built environment in and round Assen and Groningen – with the added advantage of being able to put it all into a UK context. He and his wife Judy run cycling study tours to share his knowledge . I was welcomed in Assen, at 10:30pm, by Judy Hembrow who thought it would be daft not to get me Dutch cycling straight away and helped me hire a bike at the Train station cycle hub which is open until 1:00am. Surprisingly, the shop assistant didn’t really understand why someone from England would come to Assen to “study” the cycling infrastructure and suggested that the best way to make Newcastle a cyclist-friendly city would be to send 1,000 fit Dutch men to the toon. Hmmmmmm. I finally got on my Dutch bike, feeling a wee bit nervous, following Judy around the quiet streets of Assen at night. Thankfully I had my high heels on. My big adventure had started. - A network of one-way streets with high cycling permeability in old residential areas. What more simple and effective way is there than cycling contra-flows with or without designated bicycle lanes to lower speed limit and cut down rat-runs? - A network of cyclepaths connecting households in new housing developments making it faster, pleasant and easy to undertake those day-to-day short trips on a bike rather than by car. Visiting friends and family, going to the local shops, cafes, restaurants, leisure, educational and culture facilities doesn’t involve petrol and CO2 emissions, but pedal-power and fun. 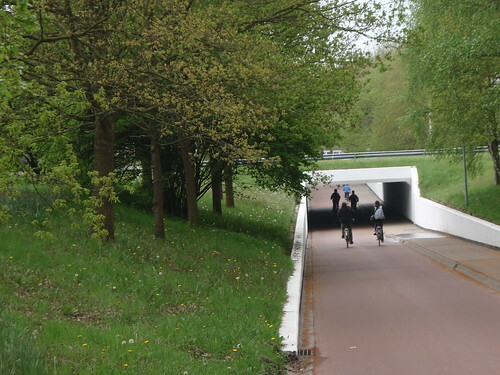 - More Cyclepaths – alongside main roads connecting suburbs, small towns and cities making it possible for teenagers to cycle to school and grown-ups to cycle to work. It is not unusual for kids to cycle 20 miles a day throughout the year. And this might explain why obesity is not really an issue in the area. - City centres and high streets where space has been re-allocated away from the cars and given to pedestrians and cyclists. The sight of pedestrians and cyclists sharing space in harmony and grace under torrential rain in Groningen will stay with me forever! - Park and ride/cycle hubs. Public transport interchanges are connected to the cycling network for a truly integrated transport system. 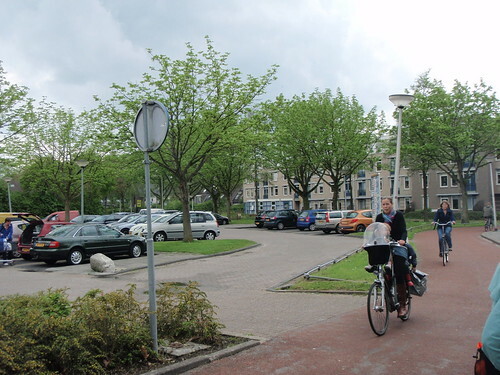 - Direct and continuous cycle routes from neighbourhoods to Assen city centre so that the fastest way to get to the centre is by bike. 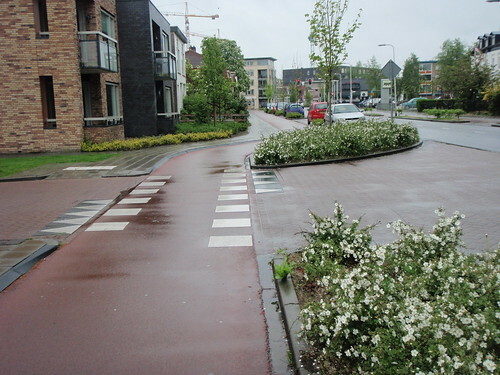 - Cycling facilities at junctions and roundabouts: green wave in Groningen maximizing travel options when cycling, elephant paths and continuity for cycle paths, bicycle traffic lights at busy junctions, to name only a few! - Bicycle-friendly access to schools, local supermarkets and other large facilities: motorised traffic is separated, bicycles get right of way, and car parking is “hidden” at the back or located further away from the entrance. There is a lot of common sense in all the infrastructure I saw. 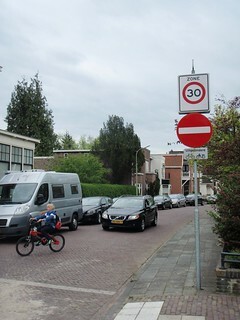 Bicycles have the priority in quiet neighbourhoods and when cyclepaths cross an access road which isn’t frequently used. In busier areas, great care is taken to keep the continuity of cylepaths and to make them clear and visible prompting motorised drivers to watch out for cyclists. 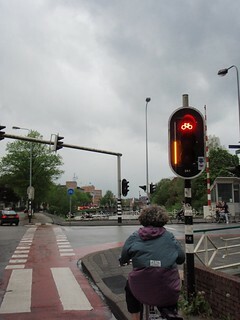 And even when cyclists have to wait their turn, they get an indication of how long they have to wait. All these changes and new developments have happened over a period of time and improvements for cyclists are being planned for the future: Assen and Groningen don’t rest on their laurels, watching other cities to catch up. They have embarked on major projects which will see their cycling levels keep going up. Their bold vision is to create an environment where cycling is the number one choice for short journeys because it takes you from A to B in the fastest, safest and most enjoyable way possible. Back in the UK, I do wonder what we are waiting for. Newcastle has a cycling strategy with an ambitious target of 20% of short trips made by bike by 2021. Maybe it is time to learn and follow the steps of Groningen, which is, by the way, one of Newcastle’s twin cities. The next Hembrow Cycling Study Tour is 11-13 September 2012. Any takers? If Claire's post has encouraged you to find out more for yourself, the Embassy is planning an annual study tour. You can see more blogs, videos and photos from last year's Embassy tour on our wiki.